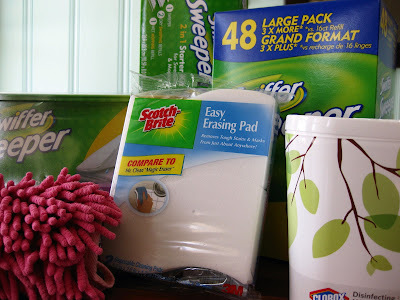 scotch brite easy erasing pad--"compare to magic eraser"
clorox disinfecting wipes--now come in pretty so you can leave them out! fuzzy wuzzy-- so pink! so cute! i could clean all day! Yay! Way to make cleaning FUN FUN FUN! Let me know how that works out for you!